The aim of the project is to design and develop an integrated drive with a magnetic bearing (1kW, 400rpm) for mixing chemical fluids in pharmaceutical industry. Normally an induction motor with an exterior rotor having mechanical bearings is used in such application. The bearings wear with usage making chemical fluid impure. This necessitates the need for magnetic bearings. Hence the design has to be different from a conventional drive with an integrated magnetic bearing. 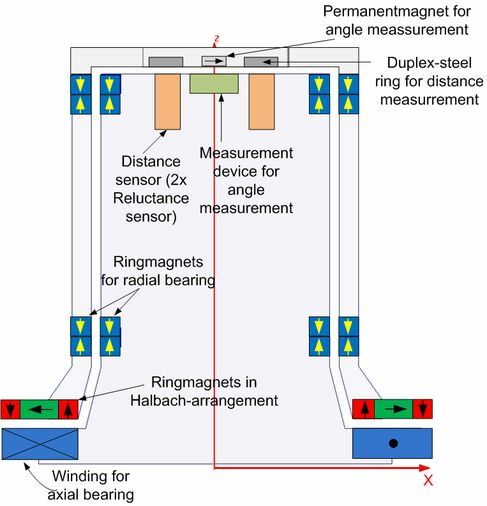 As the motor is designed for low power and speed, the forces needed for bearing action can be obtained by a combination of active and passive magnetic bearings. 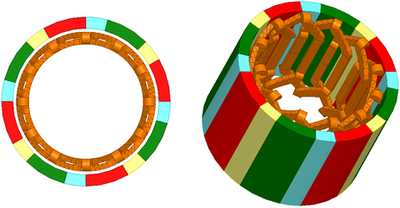 Passive bearings are realized by two ring magnets (one each on stator and rotor) at two ends and provide stabilization in the radial direction (Fig.1). The magnet material grade is high strength NdFeB. An active magnetic bearing is used for stabilization in axial direction (Fig.1). The displacement is monitored using sensors as shown in Fig. 1. Fig.2 shows the variation of axial force as a function of axial displacement and exciting current from FE analysis. Fig 3 shows the radial force as a function of radial displacement for various magnet widths. The bearing controller has to ensure that the bearing does not operate in the unstable region. Fig. 4 shows the cross-section of the motor. The interior stator with three phase concentrated winding is water cooled. The exterior rotor structure has NdFeB magnets arranged in a simple Halbach arrangement. This arrangement forces the flux lines to close within the magnet thereby increasing the magnetic flux density in the air-gap. The motor develops a torque of 20Nm at 400 min-1 with a stator current of 3A.